It was a dark and stormy night when you came to Barrowtown. The Last Light Inn was the only open door you could find, which was fine. An inn was what you needed anyway. Just a quick stay to let the storm pass, and tomorrow you would be on your way. The storm still rages outside. More and more people have come to the inn, some of them travelers like yourselves, some of them locals seeking better shelter than their meager homes could provide. Whatever their reasons, they're here now just like you, staying longer than they wanted to in a place they never intended to be. This is a recruitment thread for a PbP game of Dungeons & Dragons, using the latest (and last) packet of 5E playtest rules. I'm looking for a group of 4 level 1 PCs, run by players that can post consistently and are interested in giving this a real try and not just proving a point. I have my opinions of the 5E rules, but I'm leaving those aside in the interest of giving this system a fair shake. My intention is for anyone interested in seeing what the system looks like in actual play to be able to look here and find an example. Anyway, let's get down to the technical details. Follow the instructions in the PDF for determining your ability scores. According to the rules you can either roll 4d6 and keep the highest 3 for each stat; assign a standard array of 16, 14, 13, 12, 10, 8; or (optionally) point-buy your stats. I will allow any of these methods, so choose whichever one you like best. If you roll, you must do it here in the thread. All of the "Unusual Races" are allowed. All of the classes are allowed. No custom backgrounds. You're supposed to create them "with your DM" and I just don't want to deal with that. I'll figure this out. For now, just post your character here. There aren't that many choices to make at level 1 so it shouldn't be too cumbersome. Once I've selected the 4 people that will be playing, I'll convert this to a game thread. In-character text should be normal color (if you want a different color for your character's actual speech, go right ahead). Out-of-character text, like rules questions and such, should be in grey text. Tag people in your posts when you're waiting for them to say something so that they know. I post primarily during daytime hours, PST. If it's evening or the weekend I probably will not be posting. All of the PCs know each other and work together as a team. None of the PCs are anti-social loners, brooding types, troubled anti-heroes with a dark past, dim-witted rage-monkeys, or any similar tropes. Broody McDarkheart, Loyalguy Butkeepstohimself, Meathead Dumbjock, and Quirkythief von Robstheparty will not be starring in this particular story. Okay, go ahead and ask questions, submit characters, etc. I'll probably pick the party on Thursday unless something prevents me from doing so. Hello, i am interested in your game. I'm unsure of my availability before the weekend but i should be able to participate reasonably well. I will also be using this post to hopefully roll stats, which in turn decides my idea, and can build from there. I would love to play. I'd use the array. I really want to be proven wrong about the game. High Elf Fighter, Two Weapon Fighting Style, Mage Hand Cantrip, Guild Thief Background, 2 Short Swords and Leather Armor. I'm thinking a black sheep sort (of his family), son of an influential Mage in (insert setting city here) who didn't have the patience to learn wizardry, but had a love of the easy life. Estranged from childhood friends and family, he stumbled his way into a thieves guild nearby. He liked the work and found he was actually good at it. Halath Khaelan, son of Magister Sintos Khaelan was a lazy child. Her grew to be a lazy elf. His father tried to get him to focus on his wizardry studies, but Halath was more interested in watching the duels between rival noblemen. During this time, Halath became quite good at sneaking away and hiding from his father. Eventually his father had enough of Halath's mooching and kicked him out. With no money and few real skills Halath wandered from village to village stealing and robbing to make his way. Unfortunately he attracted the attentions of a local thieves guild and they were not happy about him poaching their territory. To make amends (to save his hide) Halath was forced to work for them for three years. Now finished with his term of service, he has moved on and has been hiring himself out as a security advisor to caravans and local merchants. I'm going to watch this game to see how it works. I guess you could consider me an alternate as well as a novice if for some reason you needed to pick me. I'm very interested as well, would like to use the standard array of 16, 14, 13, 12, 10, 8. Plan on a spellcasting halfling whose goal is to see everything. Just, never have to say the phrase "never saw that before" ever again. @Denada you mentioned a link to the playtest rules when you mentioned this game, do you have one? Seems I don't have the latest edition. I managed to find the latest playtest packet on my own. Human initially seemed a little underwhelming, but I am now seeing how nice putting a +1 in every ability score is when doing point buy. Gorstag Barrelbutt hails from a populous Dwarven clanhold. A lesser son of one of the lesser families within the clan, the prospects for Gorstag were slim. Toiling in the copper mines, or the patrolling the wall (and sometimes the mines). Gorstag chose the military. At first a lowly soldier, Gorstag found a natural talent for soldiering and became a well respected sergeant in the town guard. He trained younger dwarves, led patrols against the goblins and orcs. Fended off a roving pack of wolves surrounding a stopped wagon on the road and various other minor heroics. The death of his father in the mining accident hit Gorstag hard. He fell into a lethargy, as everything about his home was not the same without the rock solid presence of his father. Within the decade, his sisters married, and his widowed mother now keeping company with a cobbler (that asshat), Gorstag saw no more need to stay. Packing his father's favorite pipe and weed, Gorstag hit the road for adventure. I think I did that right. Its my first NEXT character. I'd like to play, but that said I'd also like to play a character that just multiclasses into everything. Hmm. Now to see if I can get this to fit a character where lvl 2 Monk/Barbarian hybrid actually makes the Barbarian's Thick Skin useful. And then begin ditching weapons and armour and just punching stuff. Denada, I can host the play test files if you send em my way. The latest version of the playtest that I have is from June of this year. If there's a later one that has Bard as a class, I'd very much appreciate being sent a link. It's apparently beyond my googling skills. I don't know the rules yet but I'll just go ahead and roll some stats! I should go 9/8/8 physical. There are respawns, right? Actually what order are the stats? Is that an okay cleric assigning down the line? There is only one ordering. Str, Int, Wis, Dex, Con, Cha. Which makes your character noticeably, um, hardy. I figured it might be D20 style actually, undoing the 4e Dex/Con flipperoo. You can just assign points to the different stats as you see fit in Next. Taking for example this Wood Elf Barbarian I'm making now, who's Strength is 8. Apparently I was wrong, looking at the most recent player character sheets I have for Next. I am... ashamed. Str, Dex, Con, Int, Wis, Cha - you're a simple, sickly cleric! Alright, fighter seems to be a popular choice, so clearly, Cleric is what we need. So i present to you a cleric i have made. 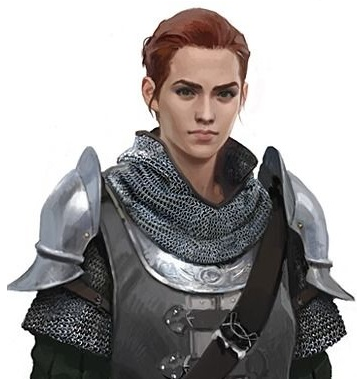 Theresa Oriana is the youngest of a minor noble family and cleric of Pelor. Eternally an optimist, each adventure is just one string of good times waiting to happen. Wether it is clearing out a goblin den or helping a town recover of an attack Theresa is always willing to give a hand. Though having received a expensive education, it never all quite sunk in, her head in the clouds dreaming of one day going out and exploring the world, her greatest desire. It wasn't until one of her older brothers went missing that she was granted permission to leave the grounds to search for him. Taking with her several of her childhood friends, she set out to find her brother. Several years have past, and she is no closer than the day she started but she will not give up. Even if she just brings home his bones, she will return her brother to home. I've got a few different ideas, one of which will depend completely on ability scores (the others would all use point-buy). Geth roll 6#4d6k3 for Sir Fabilus, the Beautiful! Okay so Fabilus is out, I have to roll an 18 in order to play him (his whole "thing" is that he's a Half-orc with 18 Charisma). Geoffrey Allenahl - Artisan Human Rogue. Geoffrey was raised by his aristocrat father, who inherited a trade business from his father. Geoffrey likes being a merchant well enough, but has found it easier, and cheaper, to supply his own protection. Part merchant, part caravan guard, part brewer, Geoffrey loves a good mystery as much as he loves a good meal. weird, double-post. If I come up with any more ideas, I'll drop them here, I guess? Proficiencies: Light + Medium Armor & Shields, Simple & Martial Weapons, Land Mounts, Str & Con Saves, Climber's Kit, Navigator's tools. Weaponry: Rapier, Longbow, Arrows (40). Cruft: Backpack, Bedroll, Rope (50), Navigator's tools, climber's kit, tent, tinderbox, mess kit, healer's kit, waterskin, traveller's clothes, winter blanket, case, parchment (10), chalk (10), oil (1). The idea being here to multiclass level 2 into Monk, stack Thick Hide with Unarmoured Defense (AC 18 if we interpret 10 + Dex as "Your natural AC without armour" in both), use Monk's punching things with Barbarian's rage somewhat, and then either multiclass further into Ranger (enchant arrows cause why not)/Rogue (backstab with raging fists) or build on Barbarian into Hawk totem (Adv. Dex, jumping, speed). Pretty much the build was originally created to try and make Thick Hide useable, as otherwise taking a shield and armour is far better AC wise than ever using the ability, especially as a melee-centric class. As for backstory, Riathar's an impetuous young Wood Elf who caused trouble within his clan(?) leading to his eventual loss of family name and exile. The condition of his return was proof of self-control and coming of age. Some 20-30 years have passed since then, with Riathar living largely alone and ranging freely throughout the various woodlands around this general area. Having meditated at such a length on his prior actions and only now feeling appropriately stable enough to avoid outbursts like those in his past, he has decided that the only way to truly test his new-found composure is to head back to civilisation and hopefully prove himself worthy enough to gain access back into his clan. While it's ultimately up to @Denada, I've not seen anywhere where those two abilities stack. They're each a specific statement, and imply mutual exclusivity. That's a fair call, but the issue I see is that the abilities were worded this way before multiclassing was added. So I highly suspect oversight prevented the statements being worded to fully flesh out what happens when both are taken. Sophia could have lived a pampered and sheltered life. Her parents were wealthy and well-connected, and they lived in the nice part of town. However, as she grew older and learned more of the dangers that the commoners faced, she realized her privileged position could put to far greater use than lying around and attending dinner parties. She hired the best tutor she could find to train her in the arts of stealth and combat. A few years later, she put that training to use fighting monsters, thugs, thieves and other ne'er-do-wells that preyed on the weak. Her father--who thought her training was supposed to be for self-defense--was less than enthusiastic about his daughter regularly putting herself in danger. For a time, he attempted to keep her from leaving the mansion; but between Sophia's training and her mother's not-so-secret support, his efforts proved to be only a minor inconvenience. He eventually came to an agreement with his daughter: he would stop opposing her if she agreed to take his most trusted servant (a halfling named Perrin Lowbranch) everywhere she went. Sophia found this acceptable. I've made plenty of 3.X and 4E characters, but this is my first time making a 5E one. Let me know if I screwed something up or omitted anything you'd like to know, Denada. If we have too many rogues and/or not enough support, I could pretty easily translate Sophia into a bard. 1. Download links have been sent to those that requested them. 2. I don't think that Thick Hide and Unarmored Defense stack. The wording on each one is "Your AC equals 10 + Dex mod + Other mod" which seems to me to be mutually exclusive. If it was "You gain a bonus to your AC equal to your ___ mod" then I could see them stacking. 3. I don't have any problem with a party of four fighters, or two rogues and two fighters, or whatever. 5E makes no assumptions about party composition. 4. The characters that have been posted so far look fine as far as creation goes. I haven't paid much attention to fluff yet but I will when it gets closer to decision time. Lumisa Kosugi the Rogue with a background in Saging. The closest one gets to being an archeologist. Gonna choose which stat goes where seeing as I've already decided on where she's going. Oh well. It was worth a try. Normally my character would be armoured and at 18ish AC at level 1, for a melee combatant, so I find Thick Hide, or any of the "don't wear armour + extra stat" abilities underwhelming (alone). But, I'd still like to run the char and see what multiclassing immediately does. @steelhawk You should add the +1 to Con that all Dwarves get. It is in addition to the +1 Str that Hill Dwarves get. Crap! How did I miss that? Thanks! I'll be looking to submit a Rogue to the council later today, after I have a chance to look at the playtest material a bit more and roll it up. I'd very much like to give 5E an earnest try and Rogue is my favorite class (in pretty much any game), so I'd like to see how that class works out. Waiting for a link- for now will roll stats so that I can shake my head and wonder why I rolled stats. While most Stout halflings are content to sit by the fire and tend their fields, Dandy was always restless. Always playing at the edge of the shire, running through the wild forests, dreaming of legendary locations and faraway lands. Perhaps it was in the blood, as Quickfoots often were struck with wanderlust. In time Dandy had learned the forests, caves, and brooks of his shire like the back of his hands, the power of the wilds seeping into him with each passing day. He'd often share this love with other halflings, often taking hunting parties into the woods for fresh game or to gather healing herbs for the priests. All the while, the trees would whisper and the winds would teach. Dandy soon found he could cast a few small spells on surrounding plants, which greatly excited him. One day, a message seemed to appear on a treed Dandy loved to nap under, in a script he had never seen yet could seemingly read with perfect clarity. It said "Welcome brother. Many are the secrets you have learned, but many more are there for you to learn. If you wish to grasp your destiny, travel forth to the kingdom of Arrul, and help to defend against a growing threat." Packing his small belongings, he bid goodbye to his parents and siblings, ready to meet his fortune. It was time to see the world, in all its glory. In Arrul he found a group of adventurers, battled against an infestation of skeletons, and was hooked forever on the life. He now wishes nothing else than to see every inch of the world and everything in it. I far prefer it to the one Wizards included in the playtest materials. Also, I'm gonna go ahead an make a Bard version of Sophia just in case; because even though Next makes no assumptions about party comp, I personally like having a relatively diverse party. I'll edit the stats into my original character post when I'm done. In the how to play PDF, all spell casters have a DC 10+mod. @Denada, which numbers do I use? The Bard's class section also mentions 8+mod for the spell DC. And speaking of the bard, are we allowing "singing" (or "voice," depending on how you want to label it) to be a spellcasting implement? The class document mentions that voice or a physical instrument can be used for bardic performance, but implies that spells can only be cast with a proficiency bonus by using a physical object. It is not known if she was the daughter of a previous wife to Lemeza Kosugi, or the illegitimate child of Professor Shorn. Either way she's a Kosugi. Years of being raised on expeditions to ruins, caves and temples have given her the spark of archeological adventure. Especially after Lemeza went into hiding, being blamed for the collapse of a famous site, and Prof. Shorn quit archeology to assume a hermetic life. She knew her best bet for returning to the life of uncovering ruins was joining bands of fighters looking to get rich off of ancient artifacts. Headstrong and fearless, she seeks undiscovered artifacts of the ancient world.